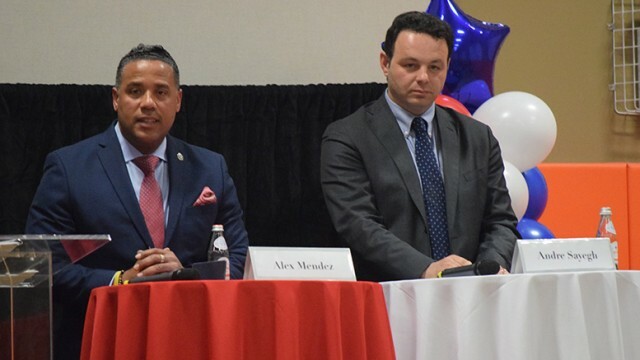 Former councilman Alex Mendez, who came in second place in last year’s mayoral race, claims mayor Andre Sayegh is targeting him and his supporters. An illegal television studio used by former councilman Alex Mendez to film a show during the mayoral race last year has been closed down. Robinson Rondon has edged incumbent Vincent Arrington in the school board race after provisional ballot count on Monday afternoon. The city’s Bangladeshi-American community turned in hundreds of petitions to additionally name Union Avenue as Bangladesh Boulevard. As many as 800 signed petitions were hand-delivered to the City Council last Thursday. A Hudson County super PAC sent out a last-minute mailer to municipal voters on Friday to sway the 17-person school board race in favor of the majority incumbent ticket. Challenger Jeyss Abreu could not answer a single question at the 6th Ward debate at City Hall on Friday afternoon. But he did not flinch in issuing blistering attacks against incumbent Al Abdelaziz. The city woman accused of slashing tires and damaging rear windshields of former councilman Alex Mendez’s supporters during the hotly contested mayoral race says she has been cleared of charges by the court.